Could a Mediterranean diet improve your brain health? You can’t talk about a heart healthy lifestyle without at least referring to the Mediterranean diet. That’s because this Greek-style eating plan is full of heart healthy foods and other healthful tips. But did you know that this diet is also good for brain health? Recent research shows that certain nutrients found in the Mediterranean diet can help with brain health aging in older adults. The Mediterranean diet is a heart healthy diet based on healthy fats like olive oil. Along with olive oil, healthy fat-containing foods like fatty fish, avocado, olives, nuts, and seeds make up the largest portion of the diet. The omega-3 fatty acids in these foods can help lower blood fats, also known as triglycerides. In addition, these fats can also help improve blood pressure and blood vessel health. The majority of foods in this eating plan are plant-based. In other words, this means eating plenty of antioxidant-rich fruits and vegetables. These foods will also provide fiber and important nutrients like potassium, magnesium, and vitamins C and E. This also means switching to whole grains if you’re going to eat breads or pastas. Also, it encourages consuming fiber and protein-rich plant foods like beans, peas, nuts, and seeds. Other eating guidelines of this diet include limiting whole-fat dairy products, red meat, processed foods, and foods high in sodium. This eating plan also encourages use of spices to flavor food instead of using table salt. Finally, to maintain a balanced healthy lifestyle, this diet encourages exercise and eating meals with family and friends. A recent study looked at healthy, older adults and how a Greek-style diet affected brain health. MRI scans and cognitive function tests measured brain health. These tests were done throughout the study and two years after the study to assess the diet’s impact on brain health. The researchers focused on 32 nutrients found in this diet. These nutrients included folate, vitamin B12, riboflavin, and vitamin D. Also, the researchers looked at antioxidants found in the Greek-style diet like omega-3 fatty acids, lycopene, and carotenoids. Study results show that such nutrients, along with omega-6 fatty acids, were involved in biomarker patterns. Also, those people who ate foods with such nutrients had better results on cognitive function tests of general intelligence, memory, and executive functions like attentional and inhibition control. So, if the heart healthy benefits of this eating plan haven’t convinced you to go Greek-style in your eating, hopefully the brain health factors did. This is because this diet has shown time and again that it ranks on top for health benefits. Therefore, take small steps towards such an eating plan. You can do this by starting to eat more vegetables one day. Then maybe trying new recipes that use olive oil to roast or stir-fry those vegetables. Finally, you can add in nuts and/or seeds as snacks for even more healthy fats and fiber. If you feel like a supplement would help you at first, then try an omega-3 fatty acid supplement. An example of a high quality omega-3 fatty acid is the fish oil supplement by Vita Sciences. This fish oil supplement contains a healthy balance of EPA and DhA, which are two important omega-3 fatty acids for brain health. Not to mention that this supplement is burpless and ensures optimal purity. Therefore, if you’re thinking about starting a healthy lifestyle this new year, consider the Greek-style diet. Not only will it help you work towards just about any health goal you have, but it will taste fresh and delicious in the process. 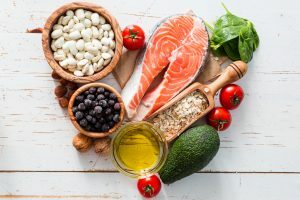 Paddock, Ph.D., C. (December 21, 2018) “Mediterranean diet nutrients tied with healthy brain aging.” Medical News Today. Romagnolo, D. F., & Selmin, O. I. (2017). “Mediterranean Diet and Prevention of Chronic Diseases.” Nutrition today, 52(5), 208-222. Zwilling, C.E., Talukdar, T., Zamroziewicz, M.K., and Barney, A.K. (March 2019) “Nutrient biomarker patterns, cognitive function, and fMRI measures of network efficiency in the aging brain.” NeuroImage, Volume 188, 239-251. Exercise is an important part of any healthy lifestyle. Along with healthy eating, managing stress, and sleeping enough, exercise is vital for heart health. However, starting an exercise program can be hard. You may think you have to start going to the gym every day and take intense classes each week to see results. The truth is though that you can reap the benefits of exercise with every step. Switch your focus from trying to fit in long bouts of activity each day. Instead, just try to focus on moving more through the day. This is because research shows that even just two minutes of activity at a time can help heart and brain health. For most adults, 30 minutes of moderate exercise is recommended each day for most days of the week. This moderate exercise can include brisk walking, water aerobics, or dancing, to name a few. During moderate exercise, your heart will beat faster and it will be harder to breathe. However, with moderate intensity you should still be able to talk. A recent report released by the U.S. Physical Activity Guidelines for Americans showed that any amount of activity can improve health. Older guidelines stated that a person had to exercise for at least ten minutes or longer for it to count towards daily exercise. However, research now shows that any decrease in sedentary behavior can help. This is because being inactive causes about 10-percent of premature death in the United States. Therefore, any single bout of exercise, even just a few minutes, can improve sleep, blood pressure, and sharpen the mind. The weekly recommended amount of exercise of 150 minutes remains the same. However, this total can come from any small bout of activity during your day. How can exercise help brain health? The heart health benefits of exercise are widely known. First of all, it helps lower risk of heart disease and type 2 diabetes. Secondly, it has shown to improve sleep, lower risk of obesity, and improve mental health. However, what may be lesser known is the impact of exercise on brain health. When it comes to brain health, exercise has found to have several benefits. First of all, being active can help improve mental health factors like anxiety and depression. Also, being active can improve brain function in those with dementia or multiple sclerosis. Finally, keeping your body active can help just about anyone improve memory, attention, and processing speed. How can I add exercise in my day? You don’t have to have a membership to a gym to stay active. In fact, just a comfortable pair of walking shoes and a little motivation can help you meet your exercise goals. Here are some tips you can use to add more activity in your day. Take the stairs instead of the elevator. 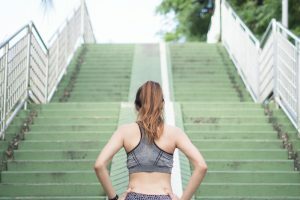 Although this may not be ideal for those with joint issues, some may benefit from taking the stairs to grab a few more steps in during the day. Park a bit further out from your destination. When you are going to the store or market, park a little but further out so you can have a few extra exercise minutes during your daily routine. During this same trip, you could also walk a few extra laps of the store or market to collect even more exercise minutes. Take a walk after dinner with your family, dog, or friends. Not only will this help your food digest a little better, but you can collect some exercise minutes at the end of your day. Walk during commercials. If the only down time you find during your day is at night, then use your TV time to stay active. During commercial breaks, no matter how short, use this time to walk around the house or walk in place. This will help you collect your exercise minutes before you go to bed. If you find that joint pain is getting in the way of your exercise goals, try a supplement like turmeric. Turmeric, like that from Vita Sciences, helps to reduce inflammation in the body which can help support a healthy heart and joints. This formula contains 95% curcuminoids as well as bioperine black pepper extract to help improve the bioavailability of curcumin. From peanuts to pistachios, or almonds to macadamias, nuts can be a delicious, healthy snack any time of day. Nuts provide a plant-based food full of fiber, protein, and antioxidants that can add flavor and health to any dish. Not only that, but research shows that adding nuts to your daily routine can improve heart health and weight management, to name a few health benefits. Let’s learn a little more about nuts and how you can make them a staple in your healthy lifestyle routine. Nuts are a plant-based food that for many years was avoided by many due to its high calorie content. However, research now shows that this calorie dense food is also nutrient dense and could benefit heart health. This is due to the healthy mixture of unsaturated and omega-3 fats as well as protein and fiber. The highest protein nuts are almonds, and pistachios at about 6 grams per ounce. Cashews are not far behind at five grams of protein per ounce. When it comes to fiber, almonds, pistachios, pecans, and hazelnuts top the list of tree nuts at 3 grams of fiber per ounce. Furthermore, pecans and walnuts provide the most omega-3 fatty acids of the tree nuts at 278 and 2565 milligrams of omega-3 fatty acids, respectively. Two recent studies looked at the health benefits of adding nuts to your daily routine. The first study looked at the impact of nut intake on weight gain. 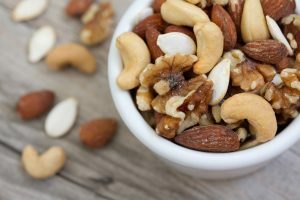 Study results show that by replacing a serving of unhealthy food with an ounce of nuts, a person could lower risk of weight gain and obesity. Such unhealthy foods that could be replaced include red meat, processed meat, French fries, desserts, or potato chips. Research suggests that by doing this you could help counteract the gradual weight gain many adults have with aging. This in turn could help reduce risk of obesity-related conditions like heart disease and diabetes. A second study looked at the impact of Brazil nut intake on overall health in healthy people. People in the study groups were given either a serving of Brazil nuts or pretzels with similar calorie and sodium content. Study results show that those given the Brazil nuts had an increased feeling of fullness. Also, nut intake prevented an increase in blood glucose and insulin levels after eating. These increases occurred with those eating pretzels about forty minutes after eating. Researchers suggest that this positive metabolic impact of Brazil nuts is likely due to its rich selenium content. Sleeping enough at night. Most adults require at least seven to nine hours of sleep each night for your best health. Experts suggest that if you don’t receive enough sleep, your risk for type 2 diabetes can increase. Therefore, if you have trouble sleeping, be sure to visit your healthcare provider for tips. They can also see if you may have pain or sleep apnea that is preventing you from sleeping well. Moving more. Staying active can help you reduce your risk of heart disease or diabetes. It does this by helping you to manage weight and improve insulin resistance. Therefore, try to engage in moderate activity for a total of 30 minutes a day most days. Such activities inlcude walking, biking, swimming, gardening, or other aerobic activity. Managing stress. Stress can sap your energy levels and can also increase blood glucose levels and blood pressure. Therefore, find ways to manage your stress like relaxation breathing, yoga, or talking to a counselor. Also, taking a walk outside can help refresh your mind so you manage stress better. Make time in your schedule for “me-time” that can help you improve your health. Taking supplements when needed. If you are B12-, iron-, or vitamin D-deficient, you can feel fatigued. This can make you not feel like being active and healthy. Therefore, be sure to have your nutrient levels checked each year. If you are low, you can take a supplement if needed to put your health on track. An example of such a supplement is Glucarex by Vita Sciences. Glucarex contains compounds like alpha-lipoic acid, cinnamon, and chromium. Along with antioxidant vitamins C and E, this supplement can help support healthy weight loss, metabolism, and blood glucose levels. Could a vegan diet improve your mood and your diabetes? Vegan diets have seemed to gain popularity over the years for several reasons. 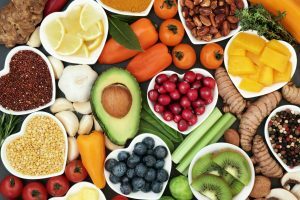 First of all, a plant-based diet full of fiber and antioxidants seems to improve heart health risk factors. Secondly, it’s a way for people to show they support animal rights. Also, it’s an eating regimen that can be fitting for those who may have dairy and or egg allergies. However, recent research shows that a vegan diet could also help improve the health of body and mind of those with type 2 diabetes. A vegan diet is one that avoids any animal products. This includes meat, poultry, fish, seafood, eggs, as well as dairy products. No to mention, that this type of diet avoids ingredients like gelatin, honey, beeswax, casein, and whey that come from animals or insects. Many vegan-certified products sit on store shelves. From meatless burgers, cookies, and dairy-free cheese, these products make this diet regimen easier to follow long-term. However, it’s important to remember that these foods are still processed. Since this diet’s health benefits stem from its plant-based nature, you should consume mostly whole foods for optimal health. 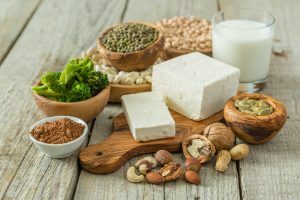 A recent study shows that eating a meat-free, dairy free diet full of plant-based foods can improve mood and overall health. This evidence review looked at studies of those with type 2 diabetes following a vegan diet. Study results show that those with diabetes on such plant-based diets had better control of their diabetes and overall health. These individuals had better control of their blood glucose levels, lipid levels, and cholesterol levels. And if that wasn’t enough to convince you to eat plant-based, these individuals saw several other benefits too. In over half of the studies reviewed, those with diabetes were able to cut down or discontinue their diabetes medicines. Also, some individuals reported reduced diabetic nerve pain as well as improved mental health factors and quality of life. A plant-based diet is not the only way to help improve your diabetes. Read below for more tips on how to feel better in body and mind whether you have diabetes or not. Stay active: It’s important for just about everyone to stay active for overall health. Exercise can help you manage stress, keep your heart string, help you to manage weight, and can also improve diabetes risk factors. When it comes to diabetes, staying active can help improve insulin resistance in the body. Therefore, try to exercise for at least 30 minutes a day most days. It doesn’t have to be anything strenuous. Just walking, gardening, or cleaning house can count towards your exercise. And you can split it up into smaller fragments of exercise like 5 or 10 minutes of exercise several times a day to make it more practical. Sleep enough each night: It’s important for most adults to sleep at least seven and nine hours a night for your best health. This is especially true for those with diabetes. This is because a lack of sleep, which throws off hormone levels in the body, can increase risk of type 2 diabetes. Manage stress: When you are stressed, your blood pressure can rise. Not only that, but stress can also increase blood glucose levels. Therefore, it’s important to find ways to manage your stress to help improve your diabetes or lower risk for diabetes. Some ways you can try to manage stress include relaxation breathing, yoga, talking to a counselor, or taking a walk when you feel stressed. Add a supplement to your daily regimen: If you are deficient in any nutrients like iron or vitamin B12, you may feel fatigue which can make it hard to stay active an healthy. Therefore, be sure to have your nutrient levels checked each year and supplement if needed. You can also try a supplement made just for those trying to control diabetes like Glucarex by Vita Sciences. Glucarex contains compounds like chromium, alpha lipoic acid, and cinnamon to help support weight loss, healthy metabolism, and healthy blood glucose levels. Kahleova, H., Levin, S., and Barnard, N.D. (May-June 2018) “Vegetarian Dietary Patterns and Cardiovascular Disease.” Progress in cardiovascular diseases, 61(1): 54-61. It may seem like common sense that living a healthier lifestyle can lower your disease risk. but what exactly is a healthier lifestyle? With so much information on health and wellness in the media, it can be hard to know what healthy really is. From low carb to keto to fasting, each diet plan claims to be the best and healthiest. However, the healthiest eating regimen is going to be the one that makes your unique body feel its best and that you can stick with for the long term. Not to mention, that being healthy is about more than just diet. Staying active, managing stress, and sleeping well enough are just some behaviors that affect health. Recent research shows that leading a healthier lifestyle can reduce your stroke risk and in turn improve your quality of life. A stroke occurs when something blocks blood flow to the brain, or when a blood vessel in the brain bursts. As a result, part of the brain can become damage or die. This can lead to brain damage, disability, or death. Therefore, it is important to know if you are at risk for stroke. And if you are, it is important to know what you can do to lower your risk. This is because the brain is vital for such functions as thinking, feeling, breathing, and digestion. So to take care of your whole body health, you need to take care of your brain. And for brain health, you need to take care of your body in many ways. This is where healthy living comes in. consumed a diet rich in fruits, vegetables, and fish. Furthermore, those who had a high genetic score and were considered unhealthy had a stroke risk score nearly double than that of those with the lowest scores and healthiest lifestyles. Besides eating right, staying active, and not smoking, there are several other things you can do to stay your healthiest. Sleep enough each night: Research shows that short or too long sleep patterns as well as insomnia with short sleep patterns, can increase risk of stroke. Therefore, be sure to find a happy balance in your sleep time. the National Sleep Foundation recommends that most adults sleep seven to nine hours each night. If you find you are having trouble sleeping, it may be helpful to visit your doctor for treatment. They could recommend a sleep study done to identify any health issues that could be disturbing your sleep. Manage stress: Stress affects all of us to some degree. However, too much stress can have an impact on your heart health. Therefore, be sure to manage your stress with some relaxation breathing, meditation, yoga, or talking to a counselor each week. Visit your doctor regularly: It’s important to visit your doctor at least once a year to check your numbers. Your numbers include cholesterol, triglycerides, blood glucose levels, blood pressure, and body weight. These numbers can help identify any heart health risk factors you may have. The earlier you find such risk factors, the earlier you can receive treatment and prevent your risk of stroke. Take supplements when necessary: If you are lacking certain vitamins or minerals in your diet, you may need a supplement such as a multivitamin or fish oil. This can help your body receive the antioxidants you need to fight oxidative stress and lower chronic disease risk factors. One such supplement is Circova by Vita Sciences. Circova contains ingredients like L-arginine, niacin, and hawthorne to help promote improved blood flow and blood pressure. Koo, D. L., Nam, H., Thomas, R. J., & Yun, C. H. (2018). Sleep Disturbances as a Risk Factor for Stroke. Journal of stroke, 20(1), 12-32. Meschia, J.F., et al. (2014) “Guidelines for the Primary Prevention of Stroke.” Stroke, 45(12): 3754-3832. Could healthy fats help promote healthier aging? It’s well-known that healthy fats can help improve heart health. But did you know that they could also help you stay healthy all over as you get older? Omega-3 fatty acids are a form of unsaturated healthy fats. You can find these fatty acids in plant-based oils and vegetables like avocado. However, you can also find healthy fats in seafood like fatty fish. It’s this latter form of fatty acids that has been studied recently in connection with aging. Let’s take a look at what omega-3 fatty acids are, where you can find them, and how they can help you stay healthy as you age. Omega-3 fatty acids are a type of polyunsaturated fatty acid you can find in plant-based oils like olive and flaxseed oils and other plant-based foods like nuts, seeds, avocado, and olives. These healthy fats can also be found in fatty fish like salmon, tuna, trout, mackerel, and sardines. The most common forms of omega-3 fatty acids include alpha-linolenic acid (ALA), eicosapentaenoic acid (EPA), and docosahexaenoic acid (DHA). You may see the names of such fatty acid types on the label of fish oil supplements. You can find ALA in the plant-based oils, and EPA and DHA in fish, fish oils, and krill oils. Fish oils come about when fish consume phytoplankton that eat microalgae. The fish then accumulates omega-3 fatty acids in their tissues. How much omega-3 fatty acids should you eat each day? Most adults should have about 1.1 grams of omega-3 fatty acids a day, whereas those who are pregnant should have about 1.4 grams a day. Recommendations for children range from 0.5 grams to 1.0 grams, with younger children requiring less. To give you an idea of how much omega-3 fatty acids are in certain foods, here are a few examples. Flaxseed oil contains 7.26 grams of ALA fatty acids per tablespoon. Chia seeds contain 5.06 grams of ALA fatty acids per ounce. English walnuts contain 2.57 grams of ALA fatty acids per ounce. Flaxseeds contain 2.35 grams of ALA fatty acids per ounce. Three ounces of cooked Atlantic farmed salmon contains 1.24 grams of DHA fatty acids and 0.59 grams of EPA fatty acids. Three ounces of cooked Atlantic wild caught salmon contains 1.22 grams of DHA fatty acids and 0.35 grams of EPA fatty acids. Fish oil supplements are another option for fulfilling your daily fatty acid needs. A typical fish oil supplement contains about 1000 milligrams of fish oil that consists of 180 milligrams of EPA and 120 milligrams of DHA. An example of a high quality fish oil supplement is produced by Vita Sciences. The Vita Sciences Fish Oil contains 1000 milligrams of fish oil with 400 milligrams of EPA and 300 milligrams of DHA. So, what is healthy aging anyway? 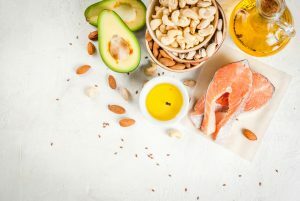 According to researchers at Tufts University at the Friedman School of Nutrition Science, healthy aging is a “meaningful lifespan without chronic diseases and with intact physical and mental function.” To see if omega-3 fatty acids could help promote healthy aging, these researchers looked at data from over 2600 people. They looked at the blood levels of omega-3 fatty acids in of adults enrolled in the United States Cardiovascular Health Study. This study observed these levels of the people in the study over about 13 years. Study results show that people who consumed more DHA-rich seafood were 24-percent less likely to experience unhealthy aging than those who consumed the least. Researchers suggest that these results likely stem from the ability of omega-3 fatty acids to reduce inflammation and improve heart health. Besides eating plenty of healthy fats in your diet, there are other lifestyle factors that can help promote healthy aging. Stay active at least 30 minutes each day for most days of the week by walking, swimming, or engaging in other physical activities. Sleeping at least 7 hours each night. Although you may not think sleep is more important than your daily tasks, it is more important than you think. This is because while you sleep, your body helps to regulate many processes. These processes include blood pressure, hormones, fluids, and body temperature, to name a few. Therefore, be sure to add a good night’s sleep to your daily to-do list. Managing stress well through yoga, meditation, prayer, relaxation breathing, or talking to a counselor. This is because by managing stress, you can reduce inflammation in the body and in turn reduce risk of chronic disease. Therefore, be sure to make time to relax so your health can be at its best. Drinking plenty of water each day to stay hydrated. This is because water is needed for many processes in the body. For example, water helps prevent constipation so waste can leave the body and it helps carry nutrients and oxygen to cells. Consuming a plant-based diet with plenty of antioxidant-rich fruits and vegetables. A plant-based diet is important because the antioxidants found in such foods help reduce inflammation. Not only that, but fruits and vegetables can help provide heart healthy fiber and other heart healthy nutrients like potassium. Sandoiu, A. (October 18, 2018) “Seafood rich in omega-3 may promote healthy aging.” Medical News Today online. Can intermittent fasting help those with diabetes? Diabetes can be a tough disease to manage. From doctor’s visits to medications to daily blood glucose checks, it can be a lot to juggle for anyone. Not only that, but having diabetes means diet changes that can make every meal or snack a challenge. Counting carbohydrates and reading labels can become a new task to take on every time you buy groceries. This can be time-consuming and can also make social events stressful. But what if someone told you that by simply cutting back on the hours you eat, you could help control your diabetes better? A recent study shows that intermittent fasting may be a new treatment for type 2 diabetes control. Intermittent fasting (IF) is a way of eating that involves extended periods of fasting coupled with periods of eating. The theory behind IF is that during fasting, your body will have time to heal. In any case, cutting back on the hours you eat during the day can help reduce snacking and in turn total calorie intake. This can help with controlling weight and any conditions related to weight like diabetes and heart disease. 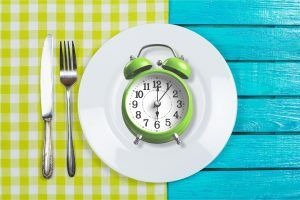 Alternate day fasting: This type of fasting consists of one day of no food restriction followed by a day of only eating one meal equal to 25-percent of your daily calorie needs. Your daily calorie needs would be the number of calories your body needs to maintain your current weight. The 5:2 fasting regimen: This regimen involves 2 days of whole day fasting each week. On these non-consecutive fasting days, you would consume no more than 25-percent of daily calorie needs. The other five days would consist of no food restrictions. However, healthy eating within your daily calorie needs is suggested for the most benefit. Time-restricted feeding: This regimen is most common with those following an IF lifestyle. It involves setting a fasting period as part of your daily routine. When you are starting out on this regimen, you may have just 12 hours of fasting. Therefore, if you stopped eating at 9 pm every night, you wouldn’t eat again until 9 am the next morning. This 12:12 regimen of fasting would help your body used to the idea of not eating as long. Over time, you can extend your period of fasting as you choose. A popular form of this diet is the 16:8 diet, which involves 8 hours of eating and 16 hours of fasting. When following an IF regimen, your eating hours should still consist of healthy eating. If you continue to consume lots of high sugar and highly processed foods, then you will not gain the most health benefit. Therefore, during eating hours you should consume mostly whole foods and a balanced diet low in sugar and refined carbohydrates. A recent study looked at the effect of IF on type 2 diabetes control. This small study involved three patients observed over several months. Patients had six hours of diabetes education and insulin adjustments at the start of the study. They were then instructed to follow three 24-hour fasting periods each week. On fasting days the patients only consumed dinner. Then on non-fasting days they consumed lunch and dinner. A low-carbohydrate eating regimen was recommended for all meals during the study period. Patients had an exam twice a month with labs, medication changes, and insulin adjustments completed as warranted. After several months, all of the patients were able to discontinue their insulin. Two of the patients were also able to discontinue their diabetes medication. Also, all three patients had improvements in their body mass index, waist circumference, and HgA1C levels. This study warrants further research on a larger scale to see if IF could help those with type 2 diabetes. Besides changing your diet, there are other things you can do to help control your type 2 diabetes. Read below for some simple steps you can make in your lifestyle today. These small steps can make a big difference in helping to control your type 2 diabetes. Stay active: Moving more each day can help to keep your blood glucose levels stable and manage your weight. In turn, this can help you to better control your type 2 diabetes. Therefore, try to be active for 30 minutes total each day for most days of the week. This could involve walking, biking, aerobics, dancing, cleaning house, or swimming, among other things. Visit your doctor regularly: Visiting your doctor every 3 to 6 months can help you stay healthy. Your doctor can also check your labs and adjust your medication as needed to help you control your diabetes better. Take a daily diabetes-friendly supplement: Taking a daily supplement to help with blood sugar control may also be helpful. A supplement like Glucarex by Vita Sciences can naturally support metabolism, weight loss, and blood glucose control. It does this through natural ingredients like chromium, cinnamon, and alpha lipoic acid that have shown to help support healthy blood sugar levels. 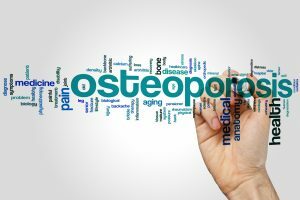 Could diabetes increase risk of osteoporosis? If you have diabetes, you may or may not know that you are at higher risk for heart disease than those who don’t have diabetes. However, in addition to heart disease, you could also be at risk for bone health issues. This risk was discovered in a recent study that found those with diabetes were at higher risk for osteoporosis than those without diabetes. Therefore, this finding warrants further research on this risk. And in turn, standard diabetes diet and supplement treatments may need to be revised to account for this higher risk. Osteoporosis is a condition that causes bone loss. It often occurs without any symptoms. Therefore, you may not know you have the condition until you fall and break a bone. The bone loss related to osteoporosis can be caused by the body losing too much bone, not making enough bone, or both. Literally, osteoporosis means “porous bone” which describes the honeycomb-like bone structure in those with the conditions. These spaces in the bone make it less dense, weaker, and more likely to break. It may be beneficial if you are 50 years of age or older, to get a bone density test. Height loss or curving of the spine may be serious symptoms of osetoporosis. Therefore, if you have such symptoms and have not yet been diagnose with osteoporosis, you should visit your doctor right away. If diganosed, treatment will likely include vitamin D and calcium supplements, an exercise program, and medications. Using data from the 2013 Danish National Health Survey, researchers looked at the connection between bone health conditions and other health factors. This analysis found that those people with diabetes were one-third more likely to have osteoarthritis than those without diabetes. These same people were also more likely to have bone related conditions like rheumatoid arthritis and osteoporosis. Likely related to such bone conditions, those with diabetes were more nearly 30-percent more likely to have back, shoulder, and neck pain as well. Researchers suggest that the link between bone health and diabetes may be inflammation. Diabetes is an inflammatory condition as is arthritis. Therefore, those with one condition may have an increased risk of developing other inflammation-related conditions. This research warrants further research on this connection of inflammatory health conditions. If you feel you may be more at risk for bone health conditions, read below for ways you can help improve your bone health. Consume plenty of calcium: Calcium is used in many parts of the body such as helping blood clot and muscles to contract. And when the body does not have enough calcium to do these things, it takes the calcium from the bones. Over time, this can make the bones weak. Therefore, be sure to have plenty of calcium in your daily diet. Foods high in calcium include milk, yogurt, fortified breakfast cereals and juices, as well as leafy greens like kale and spinach. Go outside every once in while: Vitamin D is also known as the sunshine vitamin since the body can absorb it from the sun. This vitamin helps the body absorb calcium, so it is very important to bone health. Therefore, be sure to get outside at least 10-15 minutes a day with some of your arms, legs, and face showing. During the winter, consume plenty of fatty fish like salmon, eggs, mushrooms, and fortified dairy products for vitamin D. Ask your doctor to have your vitamin D levels checked each year and take a daily supplement if your levels are low. Stay active: Exercise is great for not only keeping blood glucose levels stable if you have diabetes, but it is also good for bone health. Weight-bearing exercises like walking, hiking, jogging, dancing, and weight training are good for strengthening bones. Be sure to engage in some sort of physical activity most days of the week. You should engage in strength training such as weight exercises or resistance training at least 2 times a week. Eat a plant-based diet: Not only does a plant-based diet contain calcium-rich leafy greens, but is also antioxidant-rich. Antioxidants can reduce the inflammation that can lead to oxidative stress and increased chronic disease risk. Therefore, eat plenty of colorful fruits and vegetables at every meal and snack. Take a bone health supplement: If you are having trouble consuming enough calcium and vitamin D, a supplement may be for you. Find a supplement that combines calcium and vitamin D, or take them separate. One such supplement is Osteovent by Vita Sciences. Osteovent contains 400IU vitamin D3 and 1000mg calcium along with other important bone health nutrients like magnesium as well as antioxidants like vitamin C and bromelain. Could vitamin D be the key to preventing obesity? Obesity is a growing problem around the world today. Along with these growing statistics is also the growing amount of diet and exercise programs trying to help people lose weight. Recent research shows though that diet and exercise may not be the whole solution to the obesity issue. Vitamin D, also known as the sunshine vitamin, may be the key to helping people lose weight and lower risk of chronic disease. Vitamin D is a fat-soluble vitamin that you can soak in from the sun as well as from a few food items. Since it is not found in many foods, it is important to get this vitamin from the sun. Therefore, if you do not go outside often for any reason or if you live in an area that is very cloudy, you may have to take a supplement. Foods you can eat to get this sunshine vitamin include fatty fish like salmon, tuna, and mackerel. You can also get small amounts in beef liver, egg yolks, or cheese. Also, some milks or orange juices may be fortified with the vitamin. The recommended daily intake of vitamin D is 800 IUs, or international units. When you go to the doctor, you can ask to have your levels of the vitamin checked. It is not usually a part of the standard lab tests. Your blood level of vitamin D should be at least 30nmol/L, but ideally around 50 nmol/L. If it is less than this number, your doctor may put you on a supplement regimen to help bring up your levels of the vitamin. You can also buy vitamin D supplements on your own such as Maxasorb by Vita Sciences. Maxasorb provides 2000 IU’s of vitamin per dose. This formula provides vitamin D3 as well as vitamin E and moisturizing aloe in an easy to apply cream to help support immunity and well-being. Those who are deficient may be at risk for bone health issues like osteoporosis. Also, as current research shows, vitamin D deficient individuals may also be at risk for developing obesity. A recent study looked at the effect of vitamin D on overweight and obese children and adolescents. Study results show that those children who were given vitamin D supplements daily for 12 months had lower body mass index (BMI), body fat, and improved cholesterol levels as compared to those who were not supplemented. 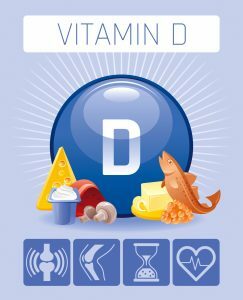 Researchers suggest that vitamin D supplements may be able to help youth reduce their risk of chronic disease as adults. Besides keeping your vitamin D levels healthy, there are other things you can do now to help reduce your chronic disease risk. Stay active: You should try to be active most days of the week for at least 30 minutes a day. This can include walking, gardening, cleaning house, swimming, cycling, or any other movement that gets your heart rate up a bit. Exercise is not only great for heart health, but can also help you expend energy to help you sleep better at night and also can help you manage stress and anxiety. Get plenty of sleep: The average adult should get at least 7 to 9 hours of sleep each night for optimal health. This is because during bedtime your body works to regulate hormones, fluids, blood pressure, and many more processes. Quit smoking or don’t start: Smoking can constrict blood vessels and in turn increase your risk of heart disease. Therefore, if you don’t already smoke, don’t start. If you do smoke, visit smokefree.gov for resources to help you quit. Limit drinking alcohol: Research has shown that alcohol can increase triglycerides, or fat, in the blood. It can also increase risk of high blood pressure and other heart health issues. Therefore, limit your alcohol intake to no more than the recommendation of one standard drink a day for women or two a day for men. One standard drink is equal to about 12 ounces of beer, 5 ounces of wine, and 1.5 ounces of hard liquor. Manage stress: Stress and anxiety can get your blood pressure high and can also impact other healthy lifestyle choices you want to make. Therefore, work on getting your stress levels down. You can do this by talking to a counselor, doing some yoga or meditation, or practicing relaxation breathing. Reducing stress can also reduce emotional eating, increase your energy, and can make you feel better overall. Could more sleep help you lose weight? Sleep is a valuable commodity. And it is a whole lot more important than many of us may think. How many times have you told yourself that you can survive on very little sleep. Or maybe you have said that you have more important things to do besides sleep. Sleep is not only important for providing you energy to get through the day. It can also impact your health in a major way if you don’t get enough. Recent research shows that getting more sleep at night could help you lose weight and improve health. Most adults should get at least seven to nine hours of sleep each night for optimal health. I know this can be hard to do all of the time because of life’s demands. However, just like a person makes time to eat healthy and exercise, it is just as important to make time for sleeping. A recent study looked at the impact of sleep loss on various health factors. Participants in the study had tissue and muscle samples taken after in the morning fasting state after a night of sleep loss and after a night of normal sleeping. Study results show that those who were sleep-deprived had a down-regulation of the glycolytic pathway in skeletal muscle. 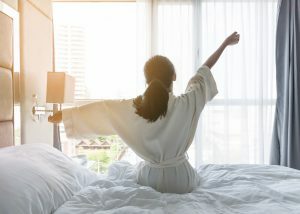 In simpler terms, those who were sleep-deprived had biological changes in their hormones like increased cortisol, reduced testosterone, and reduced growth hormone, which can all impact the body’s ability to manage a healthy weight. Also, not getting enough rest at night can reduce lean muscle mass, which in turn can negatively impact metabolism. And this in turn can affect weight management. Therefore, although this study was on the smaller side, it warrants further research on the impact of sleeping on weight management. If you have trouble getting your seven to nine hours a day, then you may need to make some adjustments to your environment or routine. Here are a few tips to help you get more z’s. Use blackout curtains: When you expose your eyes to bright lights from lamps, screens, and other sources, it can make it hard to rest. The healthy body produces melatonin, or sleep hormone at night to help you rest. However, exposure to lights can affect the circadian rhythm in your body, and in turn delay release of melatonin. Therefore, this can make it hard to get shut-eye. Blackout curtains can block natural light that may be coming in through your windows from street lamps, neighbors windows, or car headlights. Reduce screen time: Along this same line of thinking is reducing screen time. By giving your eyes a rest from the light of the screen, you can also give your mind some rest. This in turn can help you fall asleep better. Don’t eat before bedtime: If you eat a large meal less than two hours before bedtime, then you could get indigestion or heartburn. This in turn could make it hard to fall asleep. The same goes for fluids. If you drink too much before bedtime, then you may have to get up frequently in the middle of the night. These bathroom visits could interrupt the REM cycle. See your healthcare provider: If none of these strategies are helping you fall asleep and stay asleep, then there may be a medical issue to address. See your healthcare provider in such cases. A sleep study or physical exam could help yo find out if pain, sleep apnea, or another health condition may be making it hard for you to rest. In the meantime, you can try a supplement like Somnova by Vita Sciences. Somnova contains natural ingredients like melatonin and L-theanine to help promote better sleep. Be sure to ask your healthcare provider before starting any new supplement regimen.